Posy Simmonds, an English illustrator and cartoonist with ties to The Guardian and several children’s books, has now had two of her most famous works adapted into feature films, both of which coincidentally star Gemma Arterton in the title role. The first of these was 2007’s Tamara Drewe, directed by Stephen Frears (The Queen, Philomena) and was essentially a modern reworking of Thomas Hardy’s Far From The Madding Crowd, with Arterton being ogled constantly by several men because of her severe attractiveness. 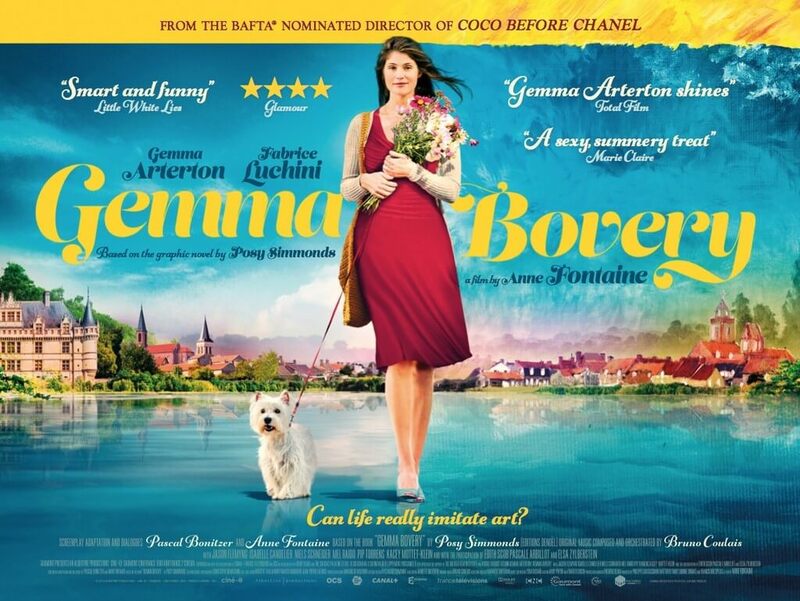 The latest is Gemma Bovery, directed by Anne Fontaine (Coco Before Chanel) and is essentially a modern reworking of Gustave Flaubert’s Madame Bovery, with Arterton being ogled constantly by several men because of her severe attractiveness – only this one’s set in France. There is certainly a sense familiarity in Fontaine’s Anglo-French adaptation of Simmonds’ graphic novel with Frears’ film, but Gemma Bovery does set itself apart in several other aspects – this story is told from the perspective of French baker Martin (Fabrice Luchini), who becomes fascinated with his new English neighbours Gemma (Arterton) and Charlie (Jason Flemyng) when he realises that they share many similarities with the characters in Flaubert’s novel, her especially. In that book, the main character – a dissatisfied housewife – begins a series of affairs with various men to fulfil her empty void; it’s not long before Martin starts to realise that art is slowly imitating life. At best, the film is a standard Woody Allen impersonation, with a neurotic sense of wit and self-deprecation mixed with bizarre events that mirror classic stories in eerily identical ways; some will find that it is closer to Allen’s Midnight in Paris, another film with a similar tone that also heavily features literary icons. Fontaine is quick to note the similarities while also making the style her own, with brief quirks such as talking to the camera or characters saying their inner monologue out loud being reworked enough to not feel like an outright imitation. However, the satirical edge that both Fontaine and Simmonds seem to be aiming for lacks any real bite and the film lags along at an unsteady pace. There are one or two pot shots at opportunist English residents of small French towns who take advantage of the luscious bread and wine they happily indulge, but it feels too sweet-natured and well-intentioned to say anything revolutionary about their obvious pretentiousness. It comes off more as a soap opera set in the French countryside than it does a comedic commentary, since the focus is more on the similarities between the novel and certain characters in the film, and the commentary is more of an afterthought. Of all the actors, Luchini is the one that feels most comfortable with the material, while everyone else doesn’t manage as strongly. Arterton, despite a decent performance, is mostly reduced to being eye candy for the several male characters, with even the camera eyeing up and down her curvaceous features to possibly mask the fact that overall, her character arc simply isn’t that interesting; and Flemyng can’t help but look miscast as her doting husband, especially when you consider the near twenty-year age difference between both actors. If we’re making the film sound worse than it actually is, that wasn’t our intention; it’s a very harmless and watchable little movie, despite its obvious flaws. The French countryside setting makes for some absolutely gorgeous scenery and cinematography, and the various scenes of neurotic Luchini becoming obsessed with Arterton’s Gemma and her endless similarities with Flaubert’s character are very entertaining, even though it comes to a dour resolution and a slightly confusing epilogue. 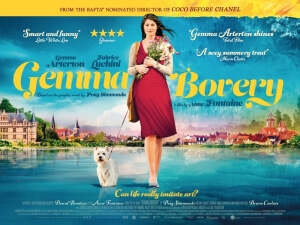 Out of the two Posy Simmonds adaptations to date, it’s hard to say which one is better since both Tamara Drewe and now Gemma Bovery have their share of strengths and weaknesses. The best way to find out is to watch both, and decide for yourselves. Gemma Bovery is a flawed but harmless adaptation of Posy Simmond’s graphic novel pastiche of Flaubert’s Madame Bovery, which takes its cues from Woody Allen though it lacks the satirical bite and consistency of some of his best work.